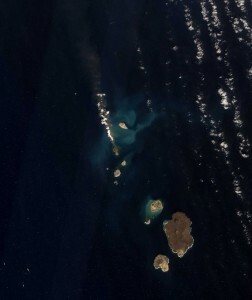 A hot new island has just surfaced in the Red Sea. What’s going on? Smithsonian scientists explain. 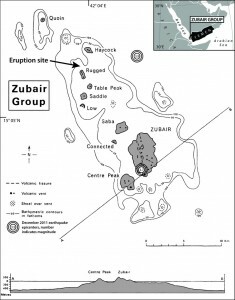 On Dec. 13, 2011, fishermen from Yemen reported a volcanic eruption in the ocean “popping up red lava that reached 20 to 30 meters high,” in the northern part of the Zubair Island Group in the Red Sea. By Dec. 23, satellites were able to photograph for the first time a new volcanic island topped by a white plume of steam and smoke. What is happening here? To give SmithsonianScience.com readers some insight into just what is happening in the Red Sea, Rob Dennen and Rick Wunderman, volcanologists in the Smithsonian’s Global Volcanism Program, together answer questions about this event. 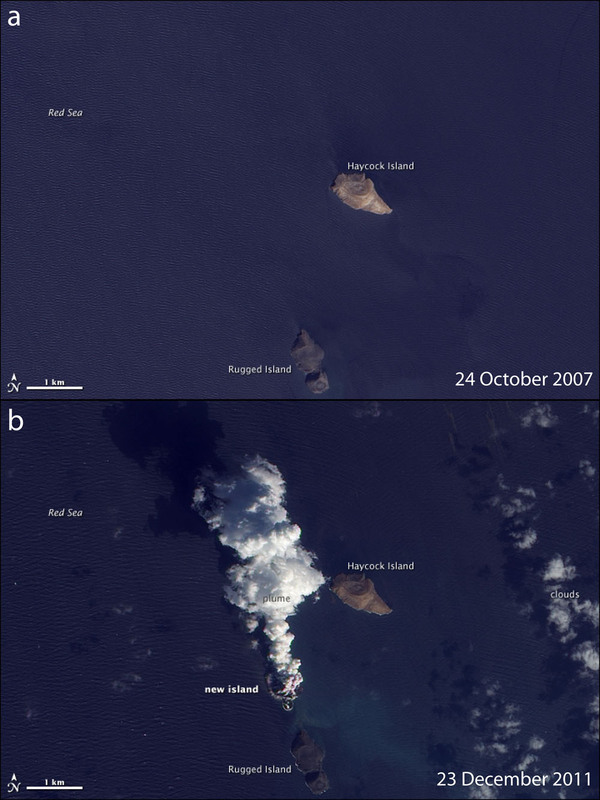 Image right: This NASA satellite image, acquired Jan. 7, 2012, shows the recent eruption in the Red Sea that has risen completely above water. Click image to enlarge. Q: Geologically what is going on in these photographs? A: The new island visible in the satellite photograph is the top of a giant shield volcano located on the rift axis in the Red Sea where the continental plates of Africa and Arabia are pulling apart. As these massive continental plates pull apart volcanic magma forcibly pushes its way up through the fissure and into the Red Sea. 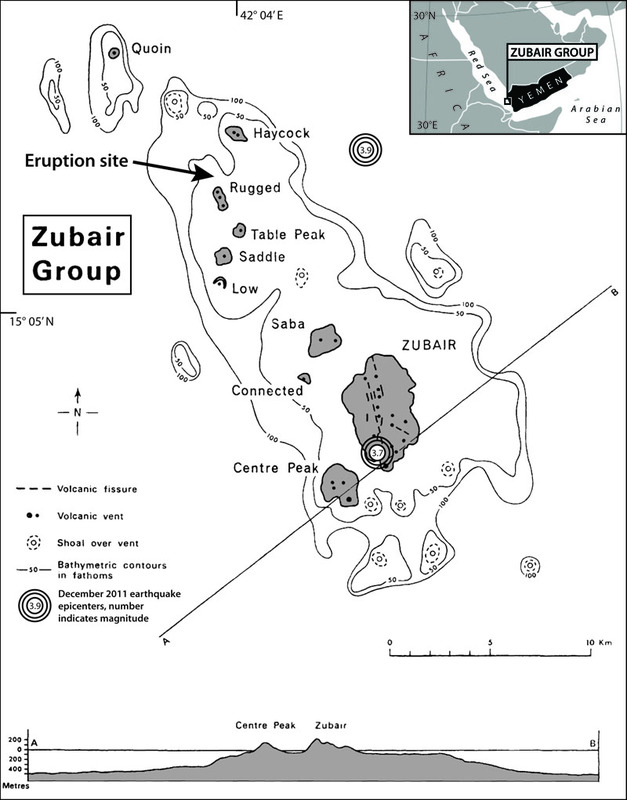 This new island emerged above water atop the shield volcano in a cluster of 10 islands called the Zubair Group. Each island represents a different vent area of the volcano and each one, during thousands of years, has been built up from the shield’s summit area, some 325 feet below sea level. This video shows the new island erupting in the Red Sea. Now that this recently active vent has emerged from the sea to make dry land, the eruption has excited media interest and people have begun to hear about it. Image right: Satellite images showing the Red Sea region where the volcanic island recently appeared before (top) and after. Q: What are the dangers of being near this newly forming island? A: It is not implausible that the edifice could fail and cause a tsunami. The aviation community hasn’t reported big plumes of smoke and ash and the maritime community hasn’t reported a lot of floating pumice. The likelihood is that this eruption is kind of local, not too energetic and of little hazard to marine navigation. Lava is probably being spattered at 164 to 325 feet. Most of its activity has been hidden underwater. Now that it has switched from a submarine eruption to an above water eruption, its style of erupting may change….perhaps to some beautiful spray eruptions. Q: What can we expect to see in the next few months from this volcanic island? A: The supply of magma supplied by the rift axis seems to be a stop-and-go process and repose of these volcanoes is a lot longer than their eruptive phase. Often in the case of submarine volcanoes they wash away in about a year from ocean currents, wind and storms. Also volcanic islands often sink due to a process we don’t understand very well. A lot of volcanoes on the sea floor are flat topped—as they were sinking, it is as if the waves chopped off their tops–gave them a haircut. So this may happen as well. Other islands in the group clearly have explosion craters of various sizes so it’s possible that before any sinking or washing away occurs, we could see more energetic explosions. Today’s activity may be as energetic as it will get or it may transition to more effusive behavior as the vent is further sheltered from the sea surface. There’s a lot more up and down to these submarine volcanoes than meets the eye. They may have quite enigmatic lava flows of 70 to 100 miles but the flows are spread out and over time they built up like a stack of pancakes. They are not formed in a central mound like inland volcanoes are. Satellite images originally published by NASA Earth Observatory.